In the letter Chairman Lindsey Graham (R-SC) and Ranking Member Patrick Leahy (D-VT), President Nick Larigakis stated AHI’s opposition to the Trump administration’s proposed $550,000 budget request for Greece’s International Military Education and Training (IMET). Instead, AHI recommended a $1.2 million funding level for Greece’s IMET program, a $200,000 increase above the FY2019 enacted level, as in the best interests of the United States. President Larigakis opposed any foreign assistance to Turkey the Administration will request based upon: Turkey’s illegal occupation of the Republic of Cyprus, its acts of aggression in the Aegean, Turkey’s threat to U.S. security interests via its purchase of Russian-made S-400 missiles, and its suppression of religious freedom of the Ecumenical Patriarchate. AHI recommended appropriations language on two policy issues to be considered by the Subcommittee: ensuring the United Nations Peacekeeping Force in Cyprus can fully implement its mandates and holding Turkey accountable for its purchase of the S-400s. 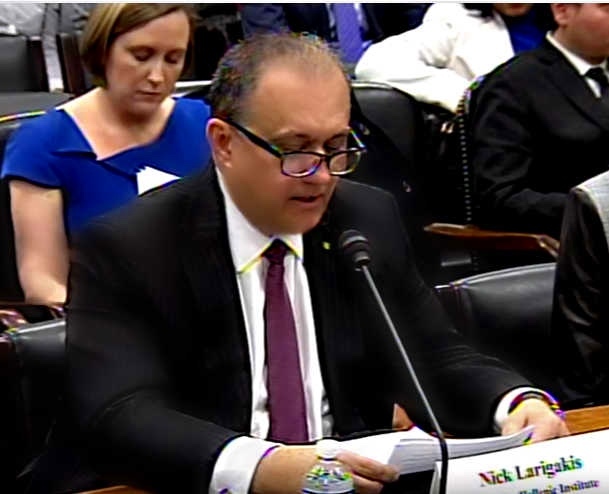 AHI’s Letter to the Appropriations Subcommittee echoed President Larigakis’ public witness testimony to the House Appropriations Subcommittee on State, Foreign Operations, and Related Programs, on March 12, 2019.